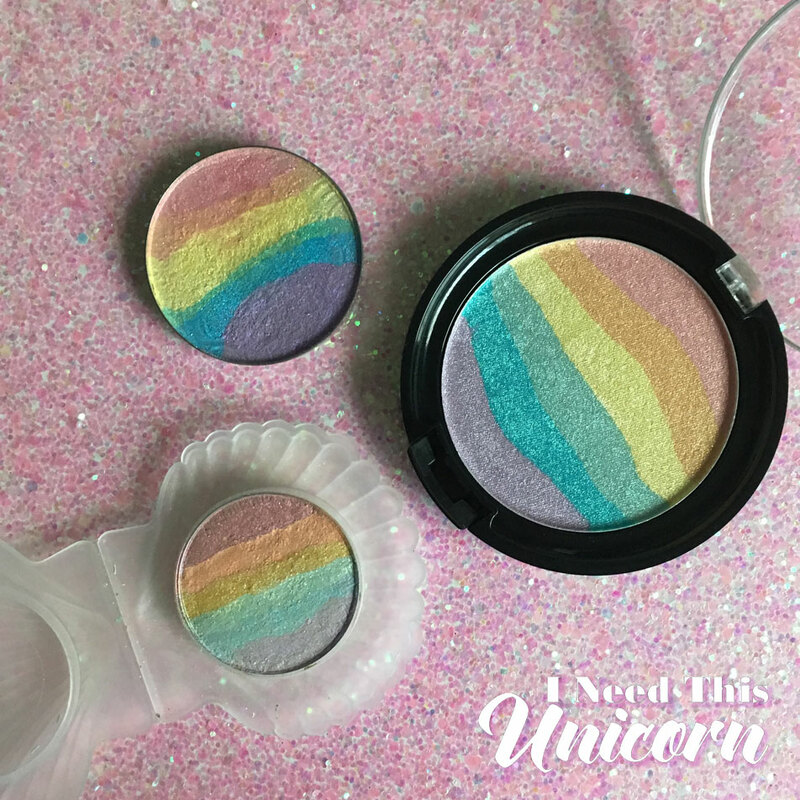 Rainbow Highlighters- Bitter Lace Beauty “Prism”, Wet ‘n Wild “Unicorn Glow” and Chaos Makeup “Kaleidoscope”. Okay, so it’s been a few months since my last post. I have been working on something BIG! I haven’t old many people about it, but it is an expansion to I Need This Unicorn. Hopefully it will no longer be a secret by January! I am really excited about this new project and hope you will all like it! But for now, this review will be my last post of the year so I can get my new baby launched! The Rainbow Highlighter was all the rage in 2016, I hope it will stay in 2017. Mostly because I have 3 of them and they need to be used. I previously reviewed the original Bitter Lace Beauty Prism highlighter, so you can read it on that page. In this review I will go over Chaos Makeup and Wet & Wild. If I ever get ahold of the Forever 21 and Hard Candy Trolls, I will make a new post with the swatches and comparisons. So far I cannot seem to get either of those! The Trolls one is super cute with the star packaging, but it’s only sold in Walmart stores. In my original review (or on IG) I probably wrote that I wore the rainbow highlighter to events like festivals. But then I started wearing it casually. I even put it on my collarbones to a fancy holiday party. It’s not In-Your-Face and I feel confident wearing it because it doesn’t look too much. It’s noticeable, without looking crazy. On another day I was shopping at Macys, and yet again, cosmetics counter employees ran up to me and asked about the Chaos highlighter. They didn’t have anything to write on, so they were making sure to memorize the name. Hopefully they were able to buy it! The thing about the rainbow highlighter… it’s supposed to highlight. Catch the light and make people swoon as you move your face. Even on dark skin, you still want it to appear as light shining on your face. Like the sunlight going through the window and casting a prism on your cheekbone. So the pigments have to be very light catching. The darker colors such as green, blue and purple have to be light enough to not look like veins or a bruise on your face. This is mostly a concern with fairer skin tones, which mine is. I bought the Chaos Makeup Kaledioscope highlighter after eyeing it for months. The swatches, plus the brand appeared to have expertise in highlighting pigments. Looking at their products and swatches, they really knew what they were doing. So I placed my order! And they did not disappoint! I got the notification email that my order was shipped in less than 30 minutes since placing the order and I got it in the mail in 2 days. I was so impressed! The packaging is the absolute cutest and may have been a selling point for me. Well, as it turns out, the packaging is not the best part, the highlighter is. Obviously, this is what we all want! The size may discourage you, but don’t let it. As I stated in my previous review, it is supposed to be small. It’s not a blush or a bronzer. You apply it in a line with your finger or a flat brush and it’s supposed to fit on the top on your cheekbones. Leaving room for a blush (if wanted) and your contour. I repeat, it is supposed to be small! The blue and green shades are not too dark. When applied to my skin it does not look like a bruise. The green is more springy and the blue is more sky… and it works! It shines on the skin and I got so many compliments at how great it looks. I have been eyeing those color shifting creams so they may be my next purchase from Chaos. When Wet N Wild’s “Unicorn Glow” highlighter was restocked I jumped at the chance so I could review it. Not that I needed a third highlighter, but the price was low enough for me to try it out. The first thing you’ll notice is that is very big. The pan is so large that I needed 2 fingers to swipe through it. However, the pigment was lacking, and I had to go over it several times just to get it to show up. I found that my flat brush was the best way to apply because the brush is huge anyway. I was shocked at how unhighlighter like the Wet N Wild one was. The green and blue were so dark, it was more like 5 unwhelmingly pigmented eyeshadows and a line of bruising on your face. It’s supposed to be highlighting! Not face painting. The blue was so dark it looked like a streak of contour. It pretty much read as someone who doesn’t know how to contour and used blue and didn’t blend. It was also very large, and it’s not really a positive. You might think, “More value for the money” but it’s just too large to fit on your cheekbone… which is where it’s supposed to go as a highlighter. But nevermind because its not even highlighting. I have personally not tested this on dark skin tones, but I assume, it’s not going to be highlighting on darker skin either… judging on how it doesn’t catch the light. It applied the pink where I would usually start the highlighter and the purple ended up under my natural contour. But the only colors that really showed up were green and blue. I tried it the upside down way, and it just looks like I’m a weirdo who put blue streaks on my cheekbone. The comments I got: “Wow, that’s really aggressive” or “Why do you have that on your face?” The last thing I need is people acting concerned because it appears as if I lost my damn mind. Don’t ask me how to enter yet, its not live. It will be obvious when the contest is live! I would have swatched all of these on my face, and photographed them for the blog. But it’s winter time and the sun sets so early that there is no freakin light! The Wet ‘n Wild swatch was terrible and off-center, so I re-did the swatches on another day. My winner as The Best Rainbow Highlighter on the market? Not to diss the original, but Chaos Makeup’s Kaleidoscope is my pick of the three I own. The blues and greens were not too dark, it didn’t look like bruises and it truly looked like a prism was shining on my face. And it’s small. Yes, that is a bonus. It HAS to be small. It’s not supposed to cover your entire cheek, it’s a highlighter, it goes on the top of your cheekbone. It’s not supposed to go all the way down to your contour line. You put your contour there! In the second swatch photo, I went over Wet ‘N Wild four times to get it to show up. As you can see, it’s not as pigmented as the indie brands. Obviously you are the judge of what you like the best! This is just my opinion on how it looks on my skin and what I look for in a highlighter. I highly recommend the Chaos Makeup “Kaleidoscope” highlighter. • At the time of writing this, it is in stock! No long waiting list! • Shipping was super fast! • Comes with it’s own case… and it’s the cutest packaging! • The price isn’t terrible at $23. It’s not $5. But it could be $45. So there you go. I was not sponsored by any company for this review. I bought each highlighter myself with my own money. My opinions are my own. There are no affiliate links. The original, Bitter Lace Beauty ” Prism”. As you can see the floral imprint is gone. I have used this a lot! Chaos Makeup Kaleidoscope. Brand new in these photos. You can see it’s a bit used in the head image. 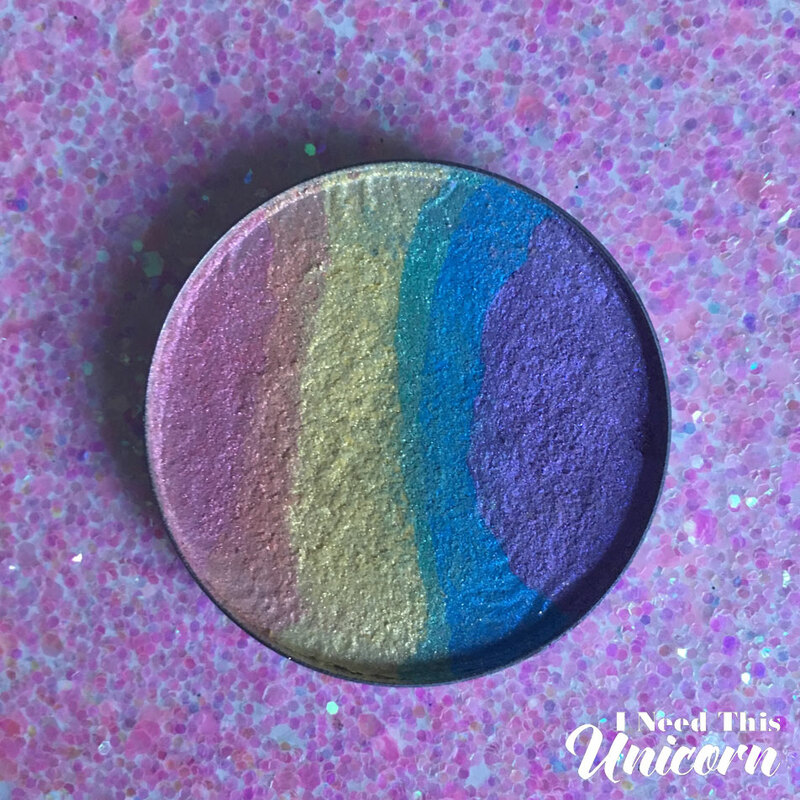 Chaos Makeup Kaleidoscope in the cute shell compact!